When I first heard about the Barre on Vegan Cuts, I was thrilled. As a beginning ballet dance student, I have been constantly refining my diet to find a good balance of energy and essential nutrients (see my Vegan Diet for Dancers series). 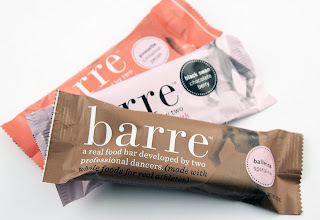 I am always searching for the best post-workout snacks, and I was delighted to have an opportunity to try one specifically tailored for the needs of active dancers. I was really impressed by the flavor and texture of these bars. They taste better than the competition, and have a great selection of ingredients. Although they are not organic, these bars don't have soy or wheat, and the sugar content is mostly from dates and some agave nectar. The pirouette and ballerina flavors were my favorites, but the black swan was good, too. I enjoyed how the ingredients were well blended and the texture was slightly chewy. The appearance of the bars, particularly the spirulina, is a little unusual, but similar to other fruit and nut bars. Perhaps one of my favorite aspects of these bars, aside from the great taste, is the marketing. The packaging is beautiful and the website is also well done. The ballet aesthetic is simple and elegant, which is a welcome change from other bars with noisy and crowded packaging. It is no surprise that these bars are sold in my area only in dance shops, but I'd love to see them in grocery stores as well. At over $2 a bar, they are more expensive than some bars in the same category, but I would splurge on these for an occasional post-workout treat or when traveling. In fact, if I were to make my own bars, they would probably look a lot like these, and I'm not sure I could make them any better (or cheaper, for that matter). If you're looking for a great bar to support an active lifestyle, this is an excellent option. Also available on Amazon.com and eligible for the Subscribe & Save program.